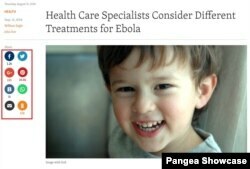 Pangea offers the option to promote your content on social networks via social buttons. There are place in the top left corner on the content page to be visible to your audience and facilitate the sharing. Once the item has been shared via one of the social network mentioned above, the page will display the number of shares per a social network. If there are more than thousand sharing, the page will display "K". The letter "K" can be localized. ​If you want to set up social share counter on all content pages, you should translate localization keys if needed and please, contact our Customer Care to set up the Counter for a site. 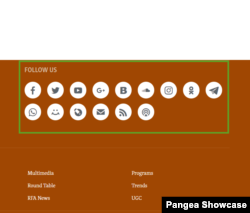 Pangea CMS also allows services to promote their own Social Media accounts by "Follow Us" social buttons positioned in the Footer navigation. Webmasters can easily set what social buttons they would like to promote and also in what order they should appear on the website by changing the Localized Value of Configuration key Responsive.FollowUs, analogically to share buttons.